Chitosan is an aminated polysaccharide derived from the de-acetylation of chitin. Its bioavailability, low immune, and toxicological response, both in vitro as in vivo and reactive functional groups that make it susceptible to chemical modification, along with the ability to promote endo-lysosomal escape and significant condensation of genetic material, have proven its potential as a gene therapy vector. , However, its ability to promote gene transfer is low compared with viral vectors, and therefore, chemically modifying chitosan is regarded as a way to improve gene delivery. We have previously produced chitosan-pDNA nanoparticles (NPs) as vectors for retinal gene therapy, which displayed low gene expression in retinal pigment epithelial cells. In an attempt to improve gene transfer and expression by chitosan, we covalently linked a group containing a disulfide bond to the amine group of chitosan. This disulfide bond should be cleaved in the presence of cytoplasmic glutathione, thus, releasing the genetic material near the nucleus, readily enabling nuclear translocation. ,, We have performed a direct comparison between the two polymers using two types of cells: human embryonic kidney (HEK 293) cells and retinal pigment epithelium cells. In the eye, we aim to target retinal pigment epithelial (RPE) cells, due to their important role in the support of the retinal homeostasis and involvement in several retinal diseases. Chitosan, with a MW of 15 kDa and degree of de-acetylation (DD), of 84% was purchased from Polysciences, Inc., USA. All other reagents were analytical grade and used without further purification. A plasmid expressing enhanced green fluorescent protein driven by the cytomegalovirus promoter (kindly provided by Dr. Jean Bennett, University of Pennsylvania, USA) was amplified in Top 10 bacteria and purified using a Plasmid Maxi kit (Qiagen, California, USA following manufacturer guidelines. Plasmid DNA (pDNA) was dissolved in TE buffer, and the concentration was evaluated using a NanoDrop 2000c spectrophotometer (Thermo Scientific, Waltham, MA) at 260 nm. Three cell lines were used for transfection and cytotoxicity evaluation: HEK 293 cells (kindly provided by Dr. Guilherme Ferreira, University of Algarve, Portugal) and two human retinal pigment epithelial cells: D407 (kindly provided by Dr. Jean Bennett, University of Pennsylvania, USA) and ARPE-19 (kindly provided by Dr. Francisco Ambrosio, University of Coimbra). All cell culture reagents were purchased from Sigma-Aldrich® (St. Louis, MO/USA). Synthesis of chitosan-3-(2-aminoethyldithio) propionyl (CS-[AEDTP]) was performed by a two-step procedure, in an adaptation of what was previously described by Pichon et al. The first step was the preparation of chitosan-3-(2-pyridyldithio) propionyl (CS-(PDP)). Briefly, chitosan (63 mg; 4.19 μmol; 352 μmol of NH 2 groups) was suspended in 5 mL of dimethyl sulfoxide (DMSO) along with 110 mg (352 μmol) of N-succinimidyl-3-(2-pyridyldithio)-propionate (SPDP), and 49 μL (35.4 mg; 352 μmol) of triethylamine. The mixture was stirred under nitrogen atmosphere for 120 h, at room temperature. The reaction was monitored by thin layer chromatography (TLC), in silica plates (Merck), and through the decrease of SPDP. A mixture 6/6/1 (V/V/V) of chlorophorm/methanol/water was used as eluent; the plates were visualized under UV light and revealed with Dragendorff reagent. The reaction mixture was poured onto approximately 10× its volume of water and centrifuged at 4°C for 1 h at 3900 g. The supernatant was decanted and the residue was vacuum dried at 40°C for 48 h.
CS and CS-(AEDPT) NPs were prepared as described previously. Briefly, a CS or CS-(AEDTP) solution (0.02% (W/V) in 0.1 M acetic acid, pH 3) and a 5 mM of sodium sulphate solution were separately preheated to 55°C. An equal volume of both solutions was quickly mixed together, vortexed for 30 s, placed on ice and stored at 4°C. To prepare pDNA loaded NPs at a NH 3 + :PO4− ratio of 5:1, 50 μg (3.4 nmol; 26.52 nmol of NH 2 groups) of CS or CS-(AEDTP) and 16.1 μg (5.3nmol; 4.8 pmol of PO4− ) of pDNA, were used. pDNA was mixed with the sodium sulfate solution and this solution mixed with the CS or CS-(AEDTP) solution, as described above, thus, producing CSpDNA 5:1, and CS-(AEDTP) pDNA 5:1 NPs. All NPs were used without further purification. Dynamic light scattering (DLS) and non-invasive back-scatter technology were used to determine the size of NPs using a detection angle of 173°. Laser Doppler velocimetry and phase analysis light scattering technology were used to measure the zeta potential of the NPs (Zetasizer Nano ZS, Malvern instruments, UK). The polydispersity index was obtained by DLS using the Zetasizer Nano Series software v 6.20. All NPs were analyzed in ddH 2 O at 25°C. Morphological analysis of NPs was performed by transmission electron microscopy (TEM) (JEOL JEM-1011 electron microscope, Tokyo, Japan). The samples were stained with 2% (w/v) phosphotungstic acid and placed on copper grids with Formvar® films for TEM observation. To evaluate the DNA-complexation capacity and protection of DNA degradation by the polymer, pDNA retention and integrity in the DNA loaded NPs was assessed by gel electrophoresis. Free pDNA or NPs were incubated with 1U of DNAse I (Sigma) for 15 min at 37°C. The reaction was stopped by adding 1μL of a 50 mM ethylenediamine tetraacetic acid (EDTA) solution and heating at 70°C for 10 min. The integrity of the plasmid was then analyzed by agarose gel electrophoresis in 1% (W/V) agarose in TAE buffer with GreenSafe Premium. Gels were run at 70 mV for 1.5 h and further visualized under UV light. To evaluate the cleavage of disulfide bonds incorporated into the CS-(AEDTP), the complexes were incubated with glutathione and dithiothreitol (DTT). These assays were performed as described previously. Briefly, a 0.4 M glutathione reduced-form (Sigma) stock solution was prepared in 0.1 M potassium phosphate buffer (pH 7.5), with 2 mM EDTA, pH 7.5 (potassium phosphate buffer with EDTA from here on referred to as PB). DNA loaded NPs prepared, as previously described, were incubated for 24 h at 37°C in PB in the presence of 20 mM glutathione, 2 units/mL of glutathione reductase (GR; Sigma), and 0.5 mM of nicotinamide adenine dinucleotide phosphate (NADPH, Sigma). CS-(AEDTP) NPs were incubated for 24h at 37 °C with increasing concentrations of DTT (10, 20, 40, 60, 80, 100 mM) in sodium acetate at 10 mM. 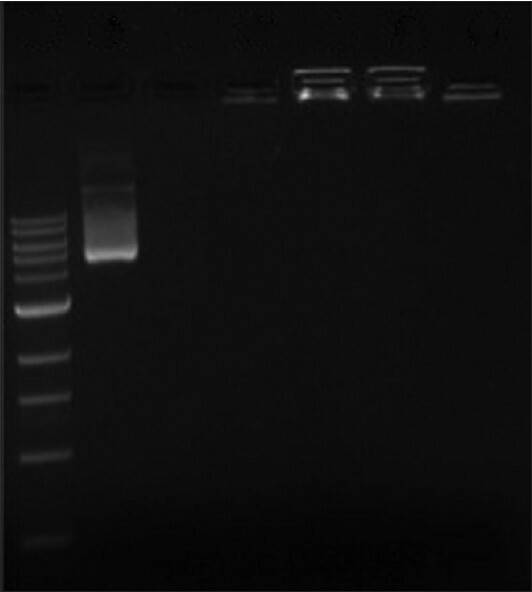 Samples were then analyzed by agarose gel electrophoresis as in the previous section. Cells were cultured at 37°C, under a 5% CO 2 atmosphere, in the appropriate media: HEK 293 and D407 in Dulbecco's Modified Eagle's Medium (DMEM) and ARPE-19 in DMEM mixture F-12 HAM (Sigma); supplemented with 5% to 10% of fetal bovine serum (FBS, PAA), 1% penicillin/streptomycin (Sigma) and 1% Glutamine (Sigma). An MTT assay was performed to evaluate the cytotoxicity of the NPs. Cells were plated, at a density of 1.5 × 10 4 cells/well in 48-well flat bottomed tissue culture plates. After 24h, the culture medium was replaced by culture medium containing 0.5 to 10.0 μg of CS and CS-(AEDTP) NPs. At 24, 48 and 72 h, 25 μL of MTT (5 mg/mL) were added to each well; cells were further incubated for 4 h. To dissolve the formed formazan crystals, the medium was replaced with 300 μL of 0.04N HCl in isopropanol. Absorbance was measured using a micro-plate reader (Tecan Infinite 2000, USA), at 570 and 630 nm, for cell viability/formazan formation and background, respectively. After subtracting the background (optical density (OD) = OD570 nm - OD630 nm), cell viability was calculated as follows: Cell viability (%) = (OD sample)/(OD control) × 100, where OD control and OD sample are cells not challenged and challenged by NPs, respectively. Cells incubated with a latex extract in culture medium (1.5 cm 2 /mL) were used as positive control for cell death, indicated in the figures as negative control. Each value was averaged from triplicates and each experiment was carried out thrice. For transfection studies, cells were plated at 1 × 10 5 cells/well in clear 6-well tissue culture plates. FuGENE HD (Promega, USA), was used as positive transfection control according to manufacturer instruction. CS and CS-(AEDTP) DNA loaded NPs were added to the cells at a ratio of 1μg of pDNA per well and further incubated for 72 h and unchallenged cells were used as negative control. Transfection efficiency was evaluated qualitatively by fluorescence microscopy and quantitatively by flow cytometry. Green fluorescent protein (GFP) positive cells were scored by flow cytometry (FACScan, BD Biosciences, USA) using FL-1H, green channel. A total of 1 × 10 6 events were counted for each sample. The percentage of positive events corresponds to the gated events minus the negative control. Statistical analyses were performed with SPSS Software version 19.0. Data were subjected to analysis of variance and differences between groups were compared with Duncan post-hoc tests. Data are expressed as means ± SD, *P ≤ 0.05. The synthesis of CS-(AEDTP) was carried out under nitrogen atmosphere in two distinct steps. The first reaction step was monitored by the decrease of SPDP [step 2, [Figure 1]] by TLC on silica gel plates. In the 2 nd reaction step, the formation of CS-(AEDTP) [step 5, [Figure 1]], is accompanied by the formation of pyridine-2-thione [step 6, [Figure 1]]. This by-product absorbs at 377 nm, which allows monitoring the reaction by UV. By consumption of the latter, we were able to determine the completion of the reaction and observed by NMR that chitosan was modified to incorporate the group containing the disulfide bond. CS and CS-(AEDTP) NPs were characterized regarding size and zeta potential [Table 1]. NPs presented a mean size of 456.28 ± 128.92 and 1105.01 ± 290.04 nm in diameter and a mean zeta potential of + 19.9 ± 2.4 and + 15.8 ± 2.9 mV, for CS and CS-(AEDTP), respectively. DNA loaded NPs presented a mean size of 254.61 ± 74.08 and 416.43 ± 160.02 nm in diameter and a mean zeta potential of +20.1 ± 2.3 and −20.1 ± 5.2 mV, for CS and CS-(AEDTP), respectively. This inversion in charge for CS-(AEDTP) was directly related to the presence of pDNA in the NPs. The NPs were further characterized regarding their pDNA loading efficiency and protection against DNAse I degradation (shown by pDNA integrity) by agarose gel retardation assays [Figure 2]. 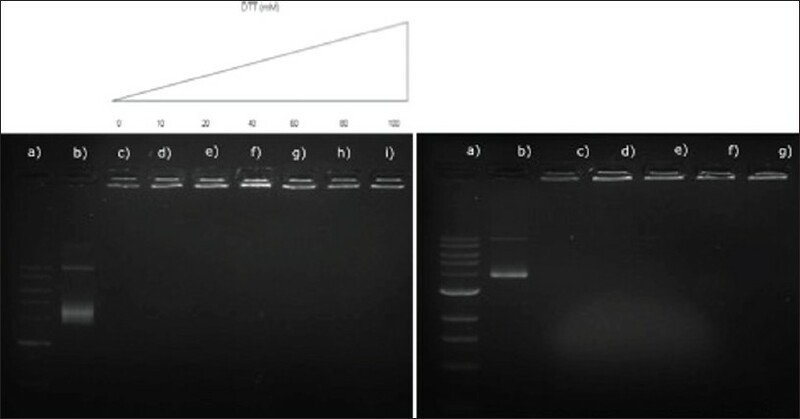 Both NPs effectively condensed pDNA, (NH3 /PO4 ratio of 5:1) as shown by the absence of free DNA migration bands in the agarose gel [Figure 2]. The produced NPs remained stable and did not release pDNA, in detectable amounts, protecting pDNA from nuclease degradation when incubated with DNase I [Figure 2]. To assess the capacity of glutathione to cleave the disulfide bonds incorporated in to chitosan, CS-(AEDTP) DNA loaded NPs were incubated with glutathione and DTT, a strong reducing agent. No detectable amount of pDNA was released from the NPs in either conditions, as observed in [Figure 3]a and b.
Morphological characterization of NPs by TEM [Figure 4] revealed a spherical morphology and no significant differences between the morphology of NPs and DNA loaded NPs (TEM micrographs shown for CS is representative of CS and CS-(AEDTP)). NPs toxicity was evaluated using the MTT assay [Figure 5]. Cell survival was not affected by concentrations below 5.0 μg of polymer with viability values above 80%. However, at 10.0 μg, both cell lines have a significantly lower cell survival percentage both for CS and CS-(AEDTP) NPs [Figure 5], in particular, ARPE-19 cells with 26.83 ± 23.06 and 25.92 ± 6.77, for CS and CS-(AEDTP) respectively. In the presence of 5.0 μg, D407 have a cell survival percentage of 66.16 ± 1.33 and 70.06 ± 9.30, for CS and CS-(AEDTP) respectively. HEK 293 (data not shown) results are similar to D407 cells for all tested concentrations. Transfection efficiency was monitored by GFP expression using fluorescence microscopy and quantified by flow cytometry [Figure 6]. GFP expression was observed up to 72 h post-transfection and, as observed for other materials, was lower than FuGENE® , an optimized commercial transfection reagent, here used as a control [Figure 6]. To ensure that the transfection efficiency is dependent on cell type, HEK 293 cells were used as a control cell line; due to their wide-spread use in similar studies. ,, Results show there is a difference in transfection efficiency between cell lines but not between CS and CS-(AEDTP). The differences in transfection efficiencies are more evident in comparison to FuGENE® , where the highest transfection was obtained with HEK 293 (72.58 ± 6.92) followed by D407 (49.13 ± 12.92) and ARPE-19 (30.14 ± 9.16). CS had transfection efficiencies of 0.36 ± 0.060; 0.33 ± 0.28 and CS-(AEDTP) 0.59 ± 0.45; 0.057 ± 0.021, for D407 and ARPE-19 cell line (data for HEK293 cells not shown). The aim of this work was to modify CS to incorporate a disulfide bond with the goal of promoting endo-lysosomal escape as well as timely release of pDNA in the vicinity of the nucleus, in order to facilitate nuclear translocation and therefore, increase the gene delivery profile of CS. TLC and NMR analysis confirmed the incorporation of the disulfide bond in CS, originating CS-(AEDTP). Regarding the pDNA complexation capacity, both CS and CS-(AEDTP) were able to complex DNA. This is shown by the decrease in size observed between CS-(AEDTP) NPs and DNA loaded NPs indicate that CS-(AEDTP) was able to form NPs, via electrostatic interactions, between anionic pDNA phosphates and the cationic polymer amine groups. The latter is also verifiable for CS. The formation of the NPs was reproducible, yielding NPs of defined size and charge, as verified by DLS [Table 1]. Both NPs formed by CS-(AEDTP) present a statistically significant increase in size when compared with CS NPs. This might be due to the increased size of the modified polymer, since the amine groups are not incorporated into the main polymeric chain, but are present as side groups, in the same amount as in CS. Also the presence of some residual tosylate counter-ions on CS-(AEDTP) polymer may somehow hinder the chain entanglement process during NPs formation and hence, the higher NP size. The tosylate counter-ion does not behave as other counter-ions, such as chloride, and instead of being promptly released in to the solvent it tends to bind to micelles and particles. It does so by immersing its aromatic ring in the hydrocarbon polymeric chains and directing their charged part towards the surface of the NP. 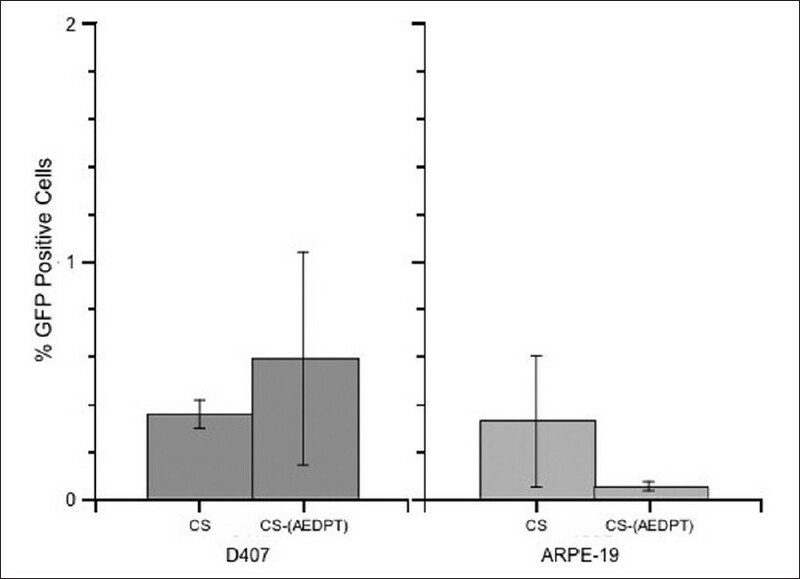 In addition, CS-(AEDTP) NPs suffer an inversion of surface charge when compared to CS NPs [Table 1], which confirms the complexation of pDNA with CS-(AEDTP). This negative charge can also be partially attributed to the presence of the tosylate counter-ion as described previously. Additionally, due to the increased size of the polymer, while maintaining the same density of amine groups, pDNA complexation yields NPs with increased size [Table 1]. Notwithstanding, NPs formed with CS and CS-(AEDTP) performed very similarly in terms of pDNA encapsulation and protection from degradation [Figure 2], suggesting no major differences in the packaging capability of the modified polymer. Both were able to efficiently incorporate and protect pDNA from DNAse I degradation, which means that they can be used to deliver pDNA to cells and protect it from extracellular and intracellular degradation. The cytotoxicity of the NPs was tested in HEK 293, D407 and ARPE-19 cell lines [Figure 5]. This is important to assess what will be the effect on cells of the polymer after DNA is released. Up to 5.0 μg of polymer, cell viability was unaffected. 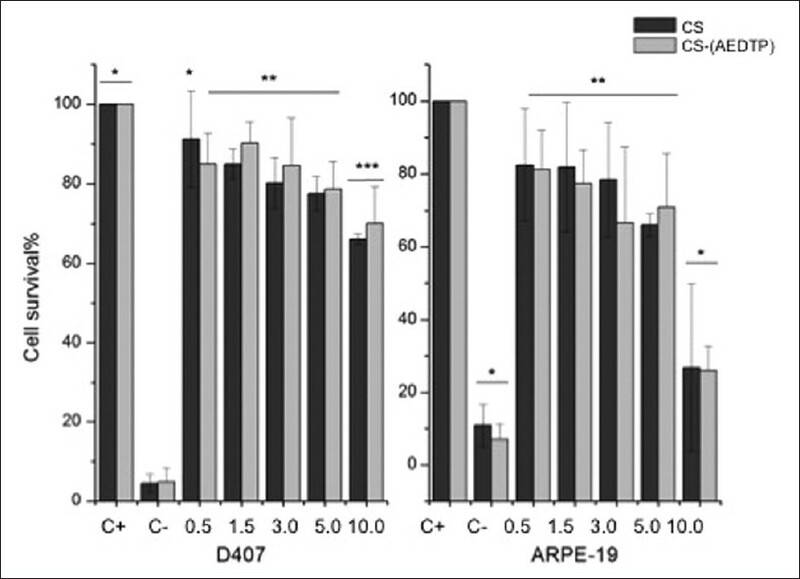 Above this value cell viability decreased for all cell lines, as expected, more markedly in ARPE-19. Notwithstanding, the highest concentrations tested are several orders of magnitude higher than the ones used for the transfection assays or in vivo in mouse models, which indicate that these polymers are not cytotoxic for cells. Additionally, since NPs are not subjected to any purification or isolation step some of the cytotoxicity observed is due to the acetic acid present in the NPs dispersion and not to the NPs or the polymer itself (data not shown). Different ways to purify the NPs are currently being evaluated: Dialysis, ultracentrifugation, and lyophilization. The former leads to an extensive dilution of the NPs, while the two latter needs to be optimized to reduce aggregation. Transfection studies with CS particles have been performed on several cell lines but never on retinal cells. ,,,, Studies with HEK 293 cells, where the same particle preparation method and pDNA amount were used, obtained a higher transfection efficiency than the one we here report for retinal cells. , This might be attributed to differences in the CS used, namely in the MW and DD, since, this is known to influence pDNA release, thus, transfection results. ,, At a constant DD, higher MWs represent more extensive polymeric chains, with a higher number of positive charges able to interact electrostatically with nucleic acids and the sum of these interactions may hinder DNA release. Contrarily, lower MWs represent fewer cationic groups to establish electrostatic interactions, hence, neither efficiently complexing nor protecting genetic material from degradation. Furthermore, cell membrane penetration and endo-lysossomal escape are also influenced by the MW and DD. For this study, we have selected a CS with an average MW and DD based on the above - referred effects, in an attempt to have a chitosan that complexes and protects nucleic acids and efficiently releases them. It is widely accepted that the success of NPs transfection is limited by cellular uptake, endossomal escape and nuclear transport. CS NPs are believed to enter the cell through endocytosis and that cell binding may be dependent on polyplex charge. ,,, Cationic NPs, such as CS, bind electrostatically to negatively charged moieties in the cellular membrane due to the presence of negatively charged surface proteoglycans. These interactions are thought to play an important role in initial steps of polyplex cellular uptake. , Kopatz et al. demonstrated the involvement of proteoglycans in this process using PEI particles. In their study, cellular entry is mediated by syndecans (a transmembrane heparan sulfate proteoglycan) through an electrostatic zipper effect of the plasma membrane onto the particles. In this way, the difference in charge between CS and CS-(AEDTP) (+20.1 ± 2.3 and −20.1 ± 5.2, respectively) can account for the lack of improvement in the transfection efficiency of CS-(AEDTP), due to hindrance in cell penetration due to poor interaction with the cellular membrane. Additionally, the different sizes of CS and CS-(AEDPT) NPs might have led them through different paths into the cell. As demonstrated previously by Rejman et al. particle size can affect the internalization pathway via clathrin-and caveolae-mediated endocytosis. Larger particles (> 200 nm to < 1 μm) enter cell in a slow manner and preferably through caveolae-mediated endocytosis or macro-pinocytosis whereas smaller particles (≤ 200 nm) enter the cell rapidly and preferably through clathrin-mediated endocytosis. , Therefore, the size increase of the NPs might have slowed down their progression once inside the cell. Therefore, the observation at 72 h post-transfection would need to be extended further in order to confirm the hypothesis of slow progression of the NPs. Chitosan-DNA interactions have been reported to be highly stable, which might be its major limiting step for pDNA intracellular release. Thiolation was generally regarded as a way to improve release, with studies showing increased transfectability of thiolated CS both in vitro as in vivo. This might be related to an increased mucoadhesion and cell permeation properties, and also due to the fact that thiolation decreases the number of positively charged amine groups, hence, establishing less electrostatic interactions with pDNA, however, resulting in more prompt pDNA release. However, in our study the number of amines capable of electrostatic interaction was similar in CS and CS-(AEDTP), therefore, the capacity of interaction with DNA was maintained, without improvement in the release. In our study, thiolation did not seem to improve the transfection efficiency in retinal cells. This is most likely due to hindered cellular penetration and the inability of intracellular glutathione to access and reduce the disulfide bonds in CS-(AEDTP) since our results show that incubation with increasing amounts of DTT and cytoplasmic concentration of glutathione did not lead to the release of pDNA in our electrophoretic assays. Therefore, the amount of cytoplasmic glutathione in RPE cells might not be enough to reduce the disulfide bonds. Another explanation might be related to the negative surface charge of CS-(AEDTP) DNA loaded NPs. Glutathione is negatively charged at physiological pH and hence it would not easily interact with and penetrate the NPs, therefore, not causing the release of the pDNA. Current work of our lab uses intracellular tracking strategies to provide information about the route for cellular penetration and pathway to the nucleus of both CS and CS-(AEDTP). Results with CS confirm that the cellular penetration is not the limiting rate, but it might be the case with CS-(AEDTP) (results not shown). The use of NPs as gene delivery vectors to target tissues has demonstrated great potential in the treatment of a large variety of pathologies, especially, as drug delivery systems. Their application in gene therapy is, to this day, limited by their low transfection efficiency. In an attempt to improve the transfection efficiency of chitosan, we have modified chitosan to incorporate disulfide bonds, since it has been described as means to enhance gene delivery by this polymer. While other studies have shown a significant increase in the transfection efficiency, our results show that for retinal cells, thiolation does not seem to improve expression of genes delivered by chitosan. To the best of our knowledge, this is the first report of such a comparison in retinal cells, which indicates that for gene therapy of the retina, thiolation of chitosan does not constitute and advantageous modification. Nevertheless, this apparent drawback may eventually be circumvented by the replacement of mercaptoethylamine p-toluenessulfonate by its hydrochloride salt, since chloride ions do not present the same problems as tosylate. IBB/CBME, LA, FEDER/POCI 2010; Fundação para a Ciência e Tecnologia (PTDC/SAU-BEB/098475/2008 to G.A.Silva, SFRH/BD/70318/2010 to A.V.Oliveira) and Marie Curie Reintegration Grant (PIRG-GA-2009-249314 to G. A. Silva) under the FP7 program. Dr. Oliveira and Dr. Silva are equally contributing authors. 1. Maguire AM, Simonelli F, Pierce EA, Pugh EN Jr, Mingozzi F, Bennicelli J, et al. Safety and efficacy of gene transfer for Leber's congenital amaurosis. N Engl J Med 2008;358:2240-8. 2. Bainbridge JW, Smith AJ, Barker SS, Robbie S, Henderson R, Balaggan K, et al. Effect of gene therapy on visual function in Leber's congenital amaurosis. N Engl J Med 2008;358:2231-9. 3. Cavazzana-Calvo M, Hacein-Bey S, de Saint Basile G, Gross F, Yvon E, Nusbaum P, et al. Gene therapy of human severe combined immunodeficiency (SCID)-X1 disease. Science 2000;288:669-72. 4. Robbins PD, Tahara H, Ghivizzani SC. Viral vectors for gene therapy. Trends Biotechnol 1998;16:35-40. 5. Gôrecki DC. ''Dressed-up'' naked plasmids: Emerging vectors for non-viral gene therapy. Discov Med 2006;6:191-7. 6. Mansouri S, Lavigne P, Corsi K, Benderdour M, Beaumont E, Fernandes JC. Chitosan-DNA nanoparticles as non-viral vectors in gene therapy: Strategies to improve transfection efficacy. Eur J Pharm Biopharm 2004;57:1-8. 7. Lollo CP, Banaszczyk MG, Mullen PM, Coffin CC, Wu D, Carlo AT, et al. Poly-L-lysine-based gene delivery systems. synthesis, purification, and application. Methods Mol Med 2002;69:1-13. 8. Lemkine GF, Demeneix BA. Polyethylenimines for in vivo gene delivery. Curr Opin Mol Ther 2001;3:178-82. 9. Mao HQ, Roy K, Troung-Le VL, Janes KA, Lin KY, Wang Y, et al. Chitosan-DNA nanoparticles as gene carriers: Synthesis, characterization and transfection efficiency. J Control Release 2001;70:399-421. 10. Romøren K, Thu BJ, Evensen Ø. Immersion delivery of plasmid DNA. II. A study of the potentials of a chitosan based delivery system in rainbow trout (Oncorhynchus mykiss) fry. J Control Release 2002;85:215-25. 11. Carreno-Gomez B, Duncan R. Evaluation of the biological properties of soluble chitosan and chitosan microspheres. Int J Pharm 1997;148:231-40. 12. Richardson SC, Kolbe HV, Duncan R. Potential of low molecular mass chitosan as a DNA delivery system: Biocompatibility, body distribution and ability to complex and protect DNA. Int J Pharm 1999;178:231-43. 13. Lee D, Zhang W, Shirley SA, Kong X, Hellermann GR, Lockey RF, et al. Thiolated chitosan/DNA nanocomplexes exhibit enhanced and sustained gene delivery. Pharm Res 2007;24:157-67. 14. Oliveira, AV, Silva, AP, Bitoque, D, Costa, AM, Silva, GA. Optimizing chitosan-based vectors for ocular gene therapy. Procedings of the 19 th Annual Congress of ESCGT, Human Gene Therapy, vol 22. 2011. p. A1-A138. 15. Wagner E, Kloeckner J. Gene delivery using polymer therapeutics. Adv Polym Sci 2006;192:135-73. 16. Elouahabi A, Ruysschaert JM. Formation and intracellular trafficking of lipoplexes and polyplexes. Mol Ther 2005;11:336-47. 17. Cavallaro G, Campisi M, Licciardi M, Ogris M, Giammona G. Reversibly stable thiopolyplexes for intracellular delivery of genes. J Control Release 2006;115:322-34. 18. Alves NM, Mano JF. Chitosan derivatives obtained by chemical modifications for biomedical and environmental applications. Int J Biol Macromol 2008;43:401-14. 19. 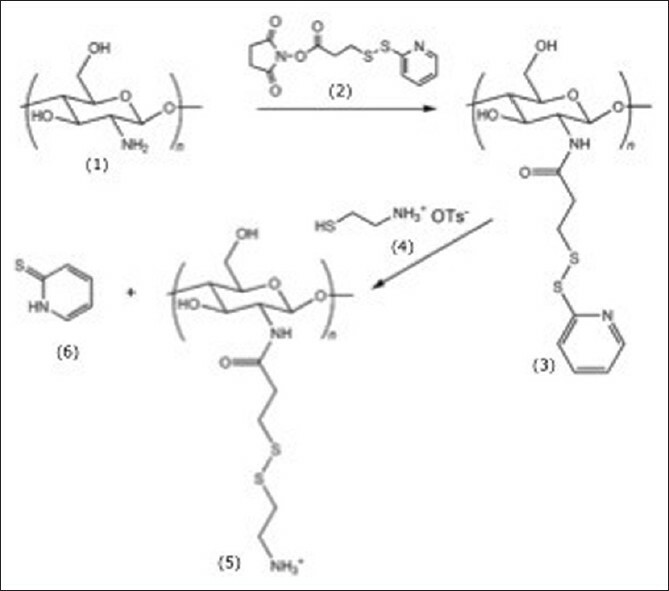 Pichon C, LeCam E, Guérin B, Coulaud D, Delain E, Midoux P. Poly Lys-(AEDTP): A cationic polymer that allows dissociation of pDNA/cationic polymer complexes in a reductive medium and enhances polyfection. Bioconjug Chem 2002;13:76-82. 20. Hiral A, Odani H, Nakajima A. Determination of degree of deacetylation of chitosan by 1H NMR spectroscopy. Polym Bull 1991;26:87-94. 21. Lönnroth EC. Toxicity of medical glove materials: A pilot study. Int J Occup Saf Ergon 2005;11:131-9. 22. Mansouri S, Cuie Y, Winnik F, Shi Q, Lavigne P, Benderdour M, et al. Characterization of folate-chitosan-DNA nanoparticles for gene therapy. Biomaterials 2006;27:2060-5. 23. Narfström K, Katz ML, Bragadottir R, Seeliger M, Boulanger A, Redmond TM, et al. Functional and structural recovery of the retina after gene therapy in the RPE65 null mutation dog. Invest Ophthalmol Vis Sci 2003;44:1663-72. 24. Ghosh SK. Influence of strongly bound counterions on the phase behaviour of ionic amphiphiles[dissertation]. New Delhi: Jawaharlal Nehru University; 2007. 25. Mao S, Shuai X, Unger F, Simon M, Bi D, Kissel T. The depolymerization of chitosan: Effects on physicochemical and biological properties. Int J Pharm 2004;281:45-54. 26. Leong KW, Mao HQ, Truong-Le VL, Roy K, Walsh SM, August JT. DNA-polycation nanospheres as non-viral gene delivery vehicles. J Control Release 1998;53:183-93. 27. Kiang T, Wen J, Lim HW, Leong KW. The effect of the degree of chitosan deacetylation on the efficiency of gene transfection. Biomaterials 2004;25:5293-301. 28. Zhao X, Yu SB, Wu FL, Mao ZB, Yu CL. Transfection of primary chondrocytes using chitosan-pEGFP nanoparticles. J Control Release 2006;112:223-8. 29. Schmitz T, Bravo-Osuna I, Vauthier C, Ponchel G, Loretz B, Bernkop-Schnürch A. Development and in vitro evaluation of a thiomer-based nanoparticulate gene delivery system. Biomaterials 2007;28:524-31. 30. Ishii T, Okahata Y, Sato T. Mechanism of cell transfection with plasmid/chitosan complexes. Biochim Biophys Acta 2001;1514:51-64. 31. Huang M, Fong CW, Khor E, Lim LY. Transfection efficiency of chitosan vectors: Effect of polymer molecular weight and degree of deacetylation. J Control Release 2005;106:391-406. 32. MacLaughlin FC, Mumper RJ, Wang J, Tagliaferri JM, Gill I, Hinchcliffe M, et al. Chitosan and depolymerized chitosan oligomers as condensing carriers for in vivo plasmid delivery. J Control Release 1998;56:259-72. 33. Medina-Kauwe LK, Xie J, Hamm-Alvarez S. Intracellular trafficking of nonviral vectors. Gene Ther 2005;12:1734-51. 34. Zuhorn IS, Engberts JB, Hoekstra D. Gene delivery by cationic lipid vectors: Overcoming cellular barriers. Eur Biophys J 2007;36:349-62. 35. Trabulo S, Resina S, Simões S, Lebleu B, Pedroso de Lima MC. A non-covalent strategy combining cationic lipids and CPPs to enhance the delivery of splice correcting oligonucleotides. J Control Release 2010;145:149-58. 36. Khalil IA, Kogure K, Akita H, Harashima H. Uptake pathways and subsequent intracellular trafficking in nonviral gene delivery. Pharmacol Rev 2006;58:32-45. 37. Kopatz I, Remy JS, Behr JP. A model for non-viral gene delivery: Through syndecan adhesion molecules and powered by actin. J Gene Med 2004;6:769-76. 38. Rejman J, Oberle V, Zuhorn IS, Hoekstra D. Size-dependent internalization of particles via the pathways of clathrin-and caveolae-mediated endocytosis. Biochem J 2004;377:159-69. 39. Köping-Höggård M, Vårum KM, Issa M, Danielsen S, Christensen BE, Stokke BT, et al. Improved chitosan-mediated gene delivery based on easily dissociated chitosan polyplexes of highly defined chitosan oligomers. Gene Ther 2004;11:1441-52. 40. Cai X, Conley S, Naash M. Nanoparticle applications in ocular gene therapy. Vision Res 2008;48:319-24.